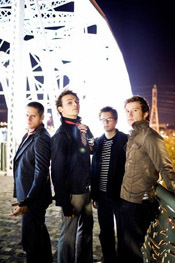 The Matches have fast made a name for themselves in the pop-punk scenes throughout the United States and Europe . 'The Locals,' or 'The Matches' as they are now known, come from the midst of Oakland California . It all started for them in 1997, when vocalist / guitarist Shawn Harris, drummer Matt Whalen and bassist Justin San Souci were still in high school. They define themselves as a band who, "rock pretty hard, have thought provoking lyrics, and can sing a hook. If a song won't get stuck in my head I won't remember the band and our goal is for people to remember us and love us." As 'The Locals', they played what could be described as reggae influenced pop-punk. Slowly their style started to shift towards a more new-wave rock style. Having grown frustrated by the lack of under 21 venues in their local area, the Matches created web casting warehouse called iMusicast in their home city and launched a show called L3: Live, Loud and Local. In an effort to promote these L3 shows, the band- now with guitarist Jon Devoto in the fold- initiated "Commo-Promo," accosting potential fans exiting concerts and clubs, student unions, dorms, high schools, malls and fast food joints, whether they were welcome or not. By performing these brief acoustic attack sets in the days prior to the L3 gigs, word soon spread and the shows started selling out- without advertising or publicity. The original sound the band produces was influenced by such acts as "Greenday, Rancid and Nirvana. That was the beginning and soon we branched out from there. We have gotten influence from Joe Jackson, Queen, Bjork, Postal service, Classic rock, Grunge and Classical. Basically if there is something in a song that moves us it becomes an influence. I feel the more bands that you listen to and can find inspiration in then the more variety your own music has." So what can be expected from The Matches new album? "The new record is going to be pretty different then the first, but it's still going to sound like us. When we first recorded our last record we were so young and just started as a band. All of us have grown immensely as musicians. There are a lot of things on this new record that we could never have played on the last record. There is a lot more variety as well; we change up tempos, a wider array of guitar tones, vocal effects. I think the record is exiting, straight though, not getting redundant or anything." Great music and smart marketing has taken the band to international heights. They have shared the stage with the likes of Yellowcard, Matchbook Romance , Less Than Jake, and many others, as well as playing on the Vans Warped Tour. It seems that the once named 'The Locals' are not so local anymore.